When you’ve been immersed in an activity for quite a while you tend to forget its illegibility to those coming to it for the first time. There are a whole bunch of things that are part of everyday practice for those with the expertise of experience. Or which are appreciated more consciously by those who have taken a step back and spend some time studying or reflecting upon the activity. Yet, the whole enterprise may seem impenetrable to the newcomer. So it is with the world of social media among academics. There are plenty of academics who are not only comfortable online but have integrated a social media presence into their working life in a way that complements analogue activity. There are plenty more who have dabbled. They’ve set up a Twitter account because that seemed like the done thing – everyone’s got one nowadays after all – but the account isn’t hugely active. They aren’t quite convinced that there’s much of value to be gained from putting in more time and effort. And there is still – in my experience at least – a substantial proportion of the academic community who don’t come anywhere near social media on a regular basis, at least not in a professional capacity. This is changing over time, of course, as training courses on tweeting, blogging and various other online activities are offered for new members of the academic community. But a chunk this input takes the form of ‘how?’ rather than ‘why?’. If we’re not careful ‘why’ boils down to ‘because it’s the sort of thing expected of the modern, engaged multi-channel academic’. 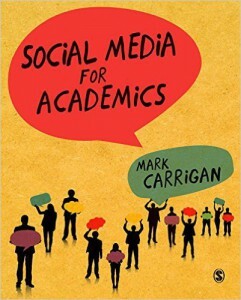 Books on digital scholarship and guides to social media aimed at academics already exist, but Sage has just added to the literature by publishing Social Media for Academics by Mark Carrigan. If you were looking for someone who knows which way is up when it comes to social media then Mark would be that person. His involvement with social media goes beyond running an individual blog and Twitter account to running social media for learned journals, research networks and institutional accounts for academic departments. He also had a stint as part of the team delivering the LSE family of policy/social science/impact blogs. The book is called Social Media for Academics and I am pretty sure academics from any discipline could gain something from it. But Mark is a sociologist by training so some of the discussion is framed in terms of the (potential) implications of social media – positive and negative – for the social sciences. Much of the academic literature referred to in the book is drawn from sociology and anthropology. But if that isn’t your particular thing – and let’s be frank it’s not entirely mine – I wouldn’t let that put you off. Because the impact of social media upon academic staff, academic life and academic practice absolutely requires interrogation from a sociological perspective. While some of the book’s chapter titles (Using social media to publicise your work; … build your network; … for public engagement; … to manage information) would suggest that you might be about to get some detailed nuts and bolts guidance, that isn’t quite what’s on offer. There certainly are suggestions on how to use social media in these areas. Some of those suggestions get down to the level of discussing particular software applications for, for example, content curation. Indeed, the book made me reflect on specific areas of my own practice like whether I could use Evernote more effectively. But it isn’t mostly a how-to guide at that level. And that’s probably wise, given the speed at which technology moves. Much of the book invites the reader to consider broader and more profound issues. There are undoubtedly important questions for academics about why you might get involved with social media – what are you, or could you, be trying to achieve? But equally important are questions about the construction and management of professional identity and the congruence between online and offline persona. Or about the tensions exposed when social media use by individual academics runs up against increasingly stringent policies on institutional branding. In a world where many academics face precarious employment situations and the likelihood of needing to move between institutions regularly, this is important in several ways. On the one hand, it can be wise for individual academics not to rely upon institutional online resources and repositories as the principal vehicle for representing their work. On the other, there is the risk that individual social media use may impair mobility, as employers take an interest in the sorts of things potential hires have – possibly imprudently – been saying online. Mark also raises the issue of how institutional desires for consistent branding can run up against, and present constraints upon, academic freedom. I don’t disagree with the broad thrust of Mark’s argument, but an incautious reading of his discussion could conclude that for him “academic freedom” equals “carte blanche” to say whatever you like with impunity. I’m sure that isn’t what he meant. I certainly think there is an important and urgent discussion to be had on the topic of academic freedom and its limits as technology advances and universities managerialise. Many of the questions Mark raises do not yet have a right – or at least no consensus – answer. Mark invites those engaging with social media to reflect upon the position they are comfortable adopting. Mark has interesting and helpful things to say about finding time for social media and dealing with the distraction of social media. He provides some valuable insights into the way in which individual academics capitalize on the potential of particular technologies. His reflections on the different publics you may be engaging with on social media, and the risks of context collapse leading to misunderstanding or worse, are spot-on. He has some thought-provoking observations on the use of metrics. The discussion is balanced: while many in the social sciences are highly critical of the turn to metrics because they are invariably a very crude way to assess value, Mark highlights that it is possible to put metrics to work for you in ways that can be helpful, as long as you keep your critical faculties switched on. While much of the discussion of social media can be about how the technology can assist us with new ways to engage in established practices, it also presents opportunities to change and challenge: to do things differently. One idea that Mark returns to at a number points in the discussion is that of the “open source academic”. Established academic practice is generally to offer the world the finished article in terms of written outputs: all the scaffolding has been removed and the plumbing hidden. However, social media offers much more scope for thinking in public and for co-creating knowledge. As an academic, there are new ways of doing. But in order for them to become prevalent new understandings of the academic endeavour need to be accepted and embedded. Mark acknowledges that the book’s coverage is incomplete. That is pretty much inevitable. One topic that could perhaps have been developed in a bit more detail is the way in which a social media sensibility is being integrated into conventional academic publishing. Journals are encouraging – or perhaps increasingly expecting – the authors of articles accepted for publication not only to blog about their papers or produce video abstracts or commentaries, but also to formulate tweetable extracts to help market the paper online. So even if, as a research active academic, you have no great enthusiasm for a personal social media profile, the chances are that you are going to have to have at least some feel for the rules of the online game. Although the book isn’t really a detailed how-to guide, I guess there are some minor tips and tricks that might have been added to the discussion, to save readers having to discover them for themselves. For example, the reason I use the images that I do for my Twitter avi is not simply because I don’t particularly want a mugshot, but also because a headshot gets lost (or rather they all look roughly the same) when you look at your timeline on a smartphone. Using a more striking image – in my case usually involving nighttime illuminations – means your avi is more distinctive and easily identifiable. Not quite as stark as a logo, but almost. The last thing to say about the book is its style. Mark’s extensive experience as a blogger communicating with a range of audiences is very evident. The book is conversational and the material it presents is easily digestible. There are some chunky topics covered, but the style remains simple. The book also contains commentary on its own construction and the way in which social media use affected it. Some readers might find this a little disconcerting or self-referential. I thought Mark successfully used this device to help to bring the points to life without crashing into the rocks of self-indulgence. His approach is almost the opposite of self-promotion because references to his own practice are often about highlight risks and challenges rather than social media triumphs. I’ve thought quite a bit about the use of social media over the last few years, but not in a particularly theoretically informed way. Mark provides accessible and engaging coverage of most of the things I’ve had on my mind, and many more besides. The theoretical burden is lightly carried. If you are thinking of venturing into the online world then this a great place to start your journey. And even if you consider yourself an old hand there is material here that will give you pause for thought. One particular issue in academic blogging (that varies between fields) is the accessibility of various papers etc. to those readers without an academic post. Part of the success of econo-blogging, apart from the natural interest driven by the financial crisis, has been the extensive network of pre-prints and working papers available online for no cost. That’s an interesting point. Economics is interesting in that regard because the pre-social media disciplinary culture was for preliminary versions of papers to circulate – possibly for years – before the published version finally emerges. It’s unusual in that regard, within the social sciences at least. The move to Open Access and the requirement to deposit pre-prints in institutional repositories if the publications are to be eligible for the REF has made this an issue for all disciplines, but I’m not sure everyone has fully worked out quite how the new system is going to/has to work.